The Show can be performed indoors or outdoors. The outdoor booth is over eight feet tall and in the traditional red white and blue stripes, with red white and blue bunting. As well as the outdoor show I also have a special indoor booth for that can be used in any indoor setting, whether it be a wedding or a children’s party in a lounge. 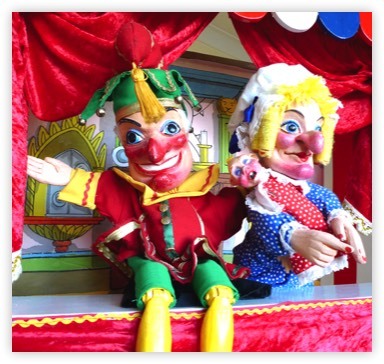 The show has all the traditional features that have made Punch and Judy such a popular part of British entertainment for generations. "Oh yes you did" "Its behind You" are a few to the traditional responses that the children will be shouting at the top of their voices. Its a non stop series of laughs as Joey the Clown joins in the fun with the policeman and an escaped monkey. On this page I include some pictures of recent shows. Above is my regular show at the historic "Tudor Barn" at Well Hall Plesaunce London. The show pulls in very large crowds and I often do two shows during an event. For outdoor shows I set a groundsheet down, and the powerful PA system is entirely battery powered so no mains power source is required. The show can last anywhere between 20 minutes and half an hour. The full show is about half an hour long and is very interactive. The puppets are directly talking to he audience and quite often getting into arguments with the children. Ihave a short video of the There is an awful lot of shouting involved! It is like a Panto but even more so. Its quite simply the best puppet show there is! Birthday parties, Weddings, Christenings and Christmas parties, Summer fetes, the Seaside. 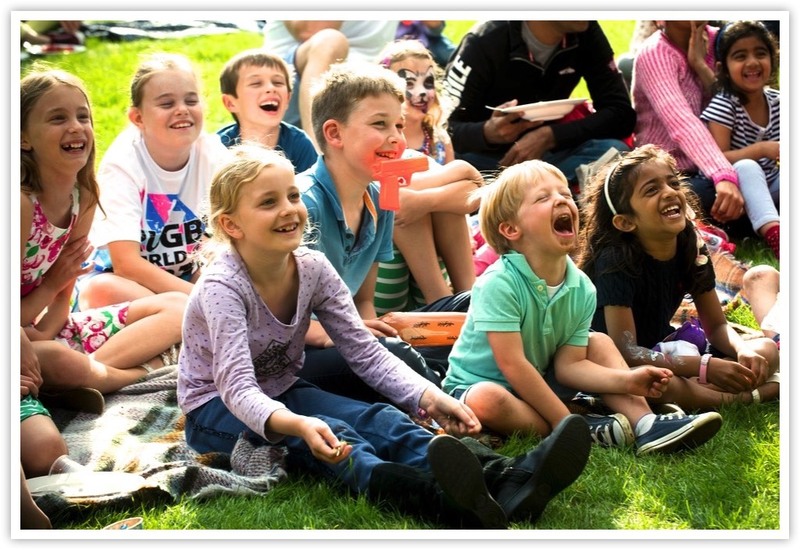 Promotions in Shops, Shopping centres, Corporate Festivals, Street Fayres and Carnivals, Craft fairs, Agricultural shows, Parks and Zoos, Punch and judy show in the following areas of Surrey: Addlestone, Ash Vale, Ashford, Ashtead. 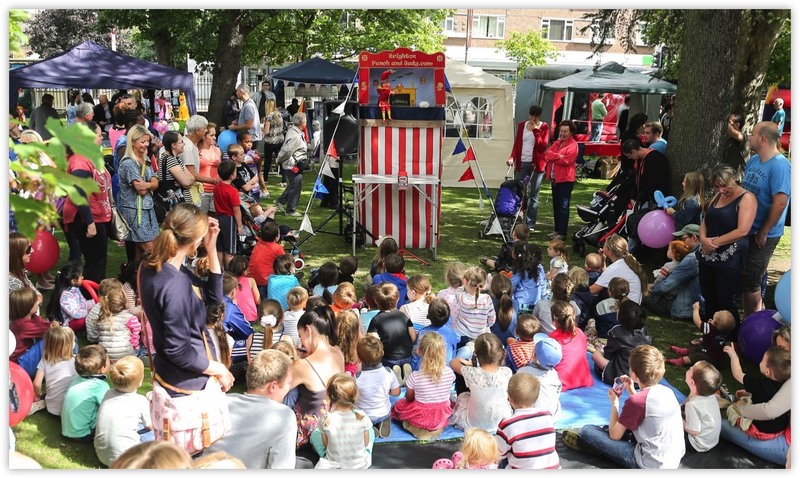 Punch and Judy in London: Abbey Manor Park, Mansion House, Marylebone, Mayfair, Mill Hill, Monument, Moorgate, Mortlake, Muswell Hill, New Cross, New Oxford Street, New Southgate, Nine Elms, North Finchley, North Kensington, Notting Hill, Oxford Street, Paddington, Palmers Green, Peckham, Penge, Pimlico, Plaistow, Poplar, Putney, Regent Street, Regents Park, Richmond, Rotherhithe, Royal Exchange, Shepherds Bush, Shoreditch, Smithfields, Soho, Somerset House, South Norwood, South Tottenham, Southgate, Southwark, St James, St James's Park, St Johns Wood, St Pancras, St Pauls, Stockwell, Stoke Newington, Stratford, Streatham, Sydenham, Wood, Acton, Aldgate, Anerley, Balham, Barbican, Barking, Barnes. entertainment, Tourist attractions, Grand openings and Product launches.Schools, Nurseries, Playgroups and Drama groups. Talks and demonstrations to Colleges, Women's Institutes and other adult groups. Byfleet, West End, West Molesey, Windlesham, Weybridge, Whyteleafe, Windlesham, Woking, Woodhatch, Worcester Park, Wormley, Punch and Judy in the following areas of Middlesex: Ashford, Brentford, Eastcote, Edgware, Enfield, Feltham, Greenford, Hampton, Hanworth, Harefield, Harrow, Hayes, Hounslow, Isleworth, Northolt, Northwood, Perivale, Pinner, Ruislip, Ruislip Manor, Shepperton. Southall, Staines, Stanmore, Sunbury, Sunbury on Thames, Teddington, Oxshott, Oxted, Pirbright, Purley, Pyrford, Redhill, Reigate, Richmond, Runnymede, Sheerwater, Shepperton, Staines, St Johns, Stanwell, Stoke d'Abernon, Sunbury, Sunbury on Thames, Surbiton, Surrey Heath, Sutton, Tadworth, Tandridge, Tattenham Corner, Thames Ditton, Thornton Heath, Thorpe, Virginia Water, Wallington, Walton on Thames, Warlingham, West Byfleet, West End, West Molesey, Windlesham, Weybridge, Whyteleafe, Windlesham, Woking, Woodhatch, Worcester Park, Wormley. Acton, Addington, Balham, Barking, Barkingside, Barnes, Barnet, Battersea, Beckenham, Beckton, Belmont, Belvedere, Bermondsey, Bethnal Green, Bexley, Bexleyheath, Bickley, Biggin Hill, Blackfen, Blackwall, Bloomsbury, Bow, Brent, Brentford, Brixton, Bromley, Camberwell, Carshalton, Catford, Charing Cross, Cheam, Chelsea. Punch and Judy in. Barnet, Battersea, Bayswater, Beckenham, Belgravia, Bermondsey, Bethnal Green, Bishopsgate, Blackfriars, Blackheath, Bloomsbury, Bow, Brent, Brentford, Brixton, Broadgate, Brockley, Bromley, Camberwell, Camden Town, Camden, Canary Wharf, Cannon Street, Catford, Charing Cross, Charlton, Cheapside, Chelsea, Chingford, Chiswick, City of Westminster, Clapham, Clapton, Clerkenwell. 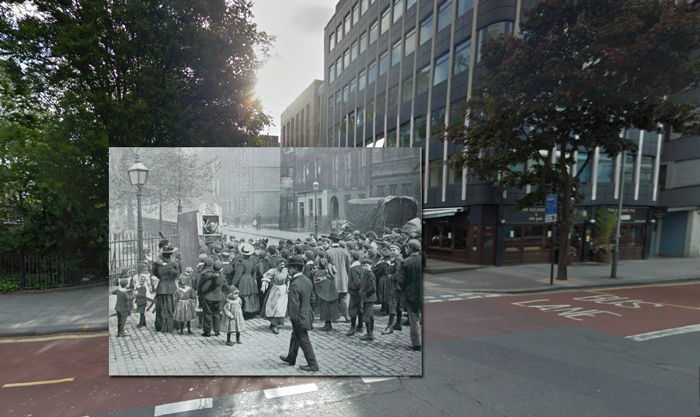 Punch and Judy Covent Garden, Cricklewood, Dagenham, Deptford, Docklands, Drury Lane, Dulwich, Ealing, Earls Court, East Dulwich, East Finchley, East Ham, Eltham, Enfield, Fetter Lane, Finchley, Finsbury, Finsbury Park, Fitzrovia, Forest Gate, Forest Hill, Fulham, Golders Green, Grays Inn, Greenwich, Guildhall, Hackney, Hammersmith, Hampstead, Hanover Square, Hanwell, Haringey, Harley Street, Harrow, Hatton Garden, Havering, Hendon, Herne Hill, High Holborn, Highbury, Highgate, Holborn, Holloway, Homerton, Hornsey, Isleworth, Isle of Dogs, Islington, Kennington, Kensington, Kentish Town, Kew, Kilburn, Kings Cross, Knightsbridge, Leadenhall, Lee, Leicester Square, Lewisham, Leyton, Leytonstone, Lower Edmonton, Maida Vale. Chelsfield, Chessington, Chingford, Chislehurst, Chiswick, City of London, Clapham, Cockfosters, Coulsdon, Covent Garden, Cowley, Cranford, Crayford, Cricklewood, Croydon, Cudham, Dagenham, Deptford, Dollis Hill, Downe, Dulwich, Ealing, Earls Court, East Barnet, East Bedfont, East Dulwich, East Finchley, East Ham, Eastcote, Edgware, Edmonton, Elm Park, Elmers End, Eltham, Enfield, Enfield Lock, Erith, Farnborough, Feltham, Finchley, Finsbury, Foots Cray, Forest Hill, Friern Barnet, Fulham, Golders Green, Goodmayes, Greenford, Greenwich, Grove Park, Hackbridge, Hackney, Hammersmith, Hampstead, Hampton, Hampton Hill, Hanwell, Hanworth, Harefield, Haringey. 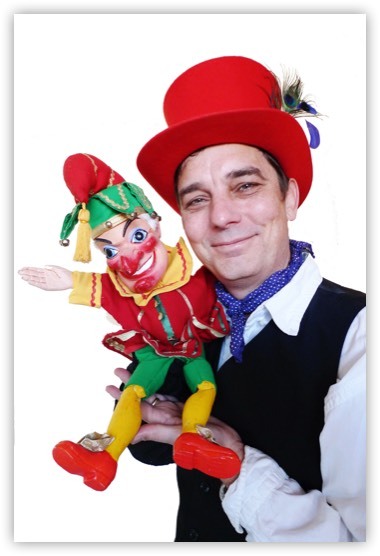 Punch and Judy Harlesden, Harlington, Harold Wood, Harrow, Harrow Weald, Hatch End, Havering, Hayes, Hendon, Herne Hill, Heston, High Barnet, Highbury, Highgate, Hillingdon, Holborn, Hook, Hornchurch, Hornsey, Hounslow, Hoxton, Hyde Park, Ickenham. Thames, Roehampton, Romford, Rotherhithe, Ruislip, Sanderstead, Seven Kings, Shepherd's Bush, Shepherds Bush, Shirley, Shooters Hill, Shoreditch, Sidcup, Silvertown, Slades Green, Snaresbrook, South Kensington, South Norwood, South Ruislip, Southall, Southgate, Southwark, Spitalfields, St Johns Wood, St Pancras, Stanmore, Stepney, Stoke Newington, Stone Grove, Stratford, Strawberry Hill, Streatham, Sudbury, Surbiton, Sutton, Teddington, Thornton Heath, Tottenham, Totteridge, Twickenham, Upminster, Upper Clapton, Upper Holloway, Upper Norwood, Uxbridge, Wallington, Walthamstow, Walworth, Wandsworth, Wanstead, Wealdstone, Welling, Wembley, West Bedfont, West Brompton, West Drayton, West Dulwich, West Ham, West Kensington, West Norwood, West Ruislip, West Wickham, Westminster, Whetstone, Whitechapel, Whitton, Willesden, Willesden Green, Wimbledon, Winchmore Hill, Wood Green, Woodford, Woodford Green, Woolwich, Punch and Judy Shows in Essex Essex: Barking, Basildon, Benfleet, Kent: Ashford, Aylesford, Beckenham, Belvedere, Bexley, Bexleyheath, Biggin Hill, Birchington, Broadstairs, Bromley, Brompton, Canterbury, Chatham, Chislehurst, Cranbrook, Dartford, Deal, Dover, Edenbridge, Erith, Faversham, Folkestone, Frindsbury, Gillingham, Gravesham, Gravesend, Greenhithe, Herne Bay, Hextable, Hollingbourne, Hoo St Werburgh, Hythe, Isle of Sheppey, Isle of Thanet, Keston, Longfield, Maidstone, Malling, Margate, Medway, New Romney, Northfleet, Orpington, Queenborough, Rainham, Ramsgate, Riverhead, Rochester, Romney Marsh, Royal Tunbridge Wells, Sandwich, Sevenoaks, Sheerness, Sheppey, Shepway, Sidcup, Sittingbourne, Snodland, Southborough, Strood, Swanley, Swanscombe, Tenterden, Thanet, Tonbridge, Tunbridge Wells, Walderslade, Welling, West Malling, West Wickham, Westerham, Westgate on Sea, Whitstable, Wigmore, Willesborough, Wilmington. Punch and Judy London lford, Isleworth, Islington, Kenley, Kensington, Kenton, Keston, Kew, Kew Bridge, Kew Gardens, Kew Green, Kidbrooke, Kingston upon Thames, Lewisham, Leyton, Limehouse, Lower Holloway, Maida Vale, Malden, Marylebone, Mayfair, Mill Hill, Millwall, Mitcham, Morden, Neasden, New Barnet, New Bedfont, New Cross, New Malden, New Southgate, Norbury, Temple, Thamesmead, The City, The Hyde, Tooting, Tottenham, Tower Hamlets, Tower Hill, Twickenham,Upper Edmonton, Upper Holloway, Upper Norwood, Vauxhall,Victoria, Victoria Dock, Walthamstow, Walworth, Wandsworth, Wapping, Waterloo, Westminster, West Brompton, West Ealing, West Kensington, West Norwood, West Wimbledon, Whetstone, Whitehall, Willesden, Wimbledon, Winchmore Hill, Wood Green, Woodford, Woolwich. Yiewsley.